Induced pluripotent stem cell (iPSC) technology has the potential to enable the next frontier in the development of cellular therapies. 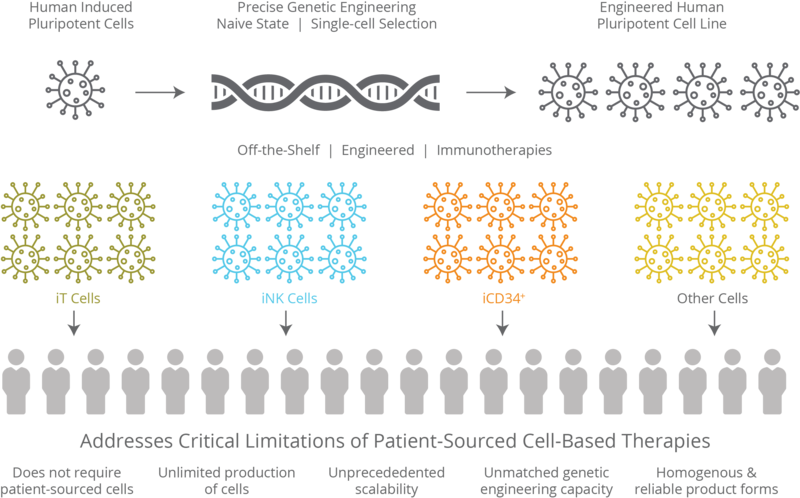 The advent of iPSCs, with their capacity to be genetically engineered and indefinitely expanded in culture, has served to create a potentially unlimited cell source for differentiation into specialized cell types and development of “off-the-shelf” cellular therapies. We have pioneered the highly efficient derivation and expansion of human iPSCs. Since our founding, we have applied our expertise in induced pluripotent stem cell biology to develop a proprietary, small molecule enhanced iPSC platform. Our patent protected iPSC platform enables us to genetically engineer, single-cell isolate and select iPSCs for clonal expansion as master iPSC lines. Our iPSC platform is supported by an intellectual property portfolio of over 90 issued patents and 100 pending patent applications that we own or license. Master iPSC lines are an ideal source for creating cell therapy product candidates that are well-defined, uniform in composition, have a consistent and dose-dependent pharmacology profile, and can be delivered off-the-shelf for the treatment of large numbers of patients. We direct the fate of master iPSC lines to create cells of the immune system, including NK cells, T cells and CD34+ cells, and are advancing a pipeline of off-the-shelf cellular immunotherapies derived from master iPSC lines.